My friend Lauren (from granola project!) 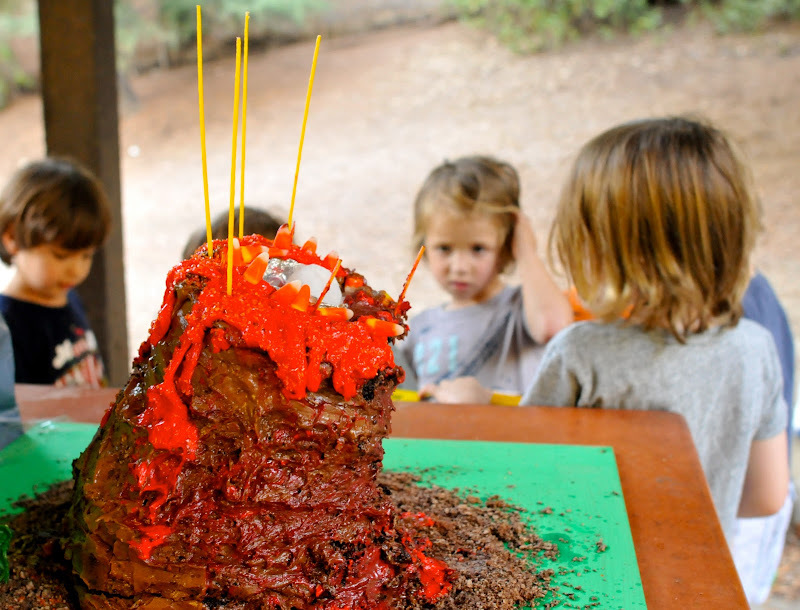 wanted to make a birthday cake in the shape of a volcano that actually spewed edible lava for her son Roman's fourth birthday party and asked me if I had any interest in helping her... Uhm, don't ask silly questions. And so it began. We dove into researching the world of "special effects" cooking. I may have even purchased this. We came up with a plan. 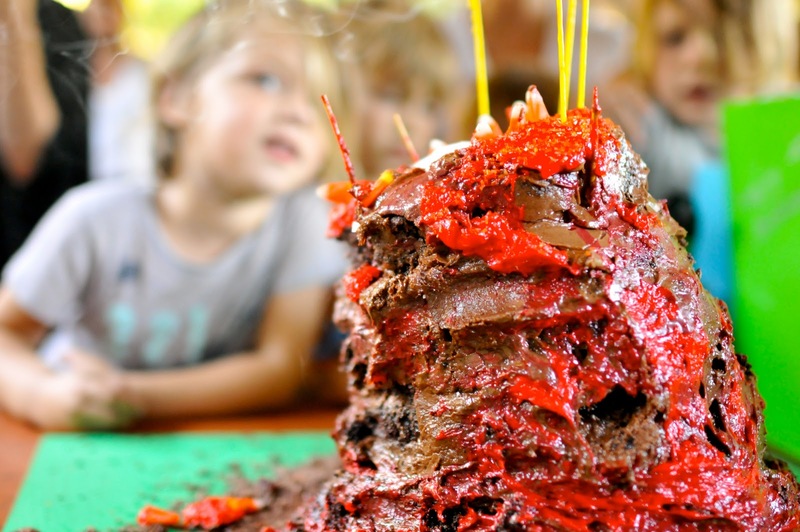 I was to make two layers of chocolate cake, a ton of chocolate icing and a bit of white icing (which we would dye red for the spewing lava.) Lauren would make four chocolate cake layers and provide the mise-en-scène. We would meet up the morning of the party, build the volcano cake, and then I would go to work and Lauren would take the cake with her to the party. The plan was rock solid. Nothing could go wrong, right? (We relied on many different sources for our volCAKEno, so it's impossible to narrow the their version photo to just one.) We used Clare Crespo's Hey There, Cupcake as visual inspiration. We used the very au courant Special Effects Cookbook for technical and logistical inspiration. And we used Sarah Magid's Organic & Chic for her delicious icing recipes. Lauren's kitchen-project style is so much more relaxed than mine, which equaled more fun, less panic and the freedom to do things like disassemble Roman's easel and paint the flat board part of it to use as a base for the volcano. I LOVED it. "You're such a fun Mom!" were my exact words I believe. We were nervous about transporting it, but we had pushed four shish kebab skewers into the cake for support and decided to put one of those big blue plastic tubs over it for the car ride. That'll do, right? If it starts to slide a bit, the plastic tub will set it straight. I don't see why not? OK, great. Gottaruntowork!!Goodluck,Lauren!HappyBirthday,Roman!!!Byeee!! 2:32pm: Rushing to buy back-up cake now. However, rumors of dry ice and a volcano cake underneath a plastic tub began to swarm the party. And well, I think these photos speak louder than words at what happened next. Doesn't this perfectly sum up the mind of a stressed parent rushing out to buy a replacement birthday cake moments before the party starts? Since this all took place two weeks ago, I've had some time to reminisce and some fun comparing the volcakeno to the Titanic, specifically that one line from the movie: "He figures anything big enough to sink the ship they're gonna see in time to turn. The ship's too big with too small a rudder. It doesn't corner worth a damn. Everything he knows is wrong." None of our research delved into the logistics of driving the cake up to Griffith Park. None of our research mentioned the idea of setting it up in the refrigerator and definitely didn't take into consideration 90+ degrees outside. Should we have thought about these things on our own? Probably. Did we learn a lot for next time? Most definitely. I guess that's why the Special Effects Cookbook left an entire page for notes. 1. Use 10-inch cake pan or larger for the base and make sure to really trim each additional layer so that you end up with more of a pyramid (and not a tower) by the end. 2. Allow time to set the cake up in the refrigerator before the final icing layer. 3. If transporting cake, consider investing in some of those wooden dowel rods for support. 4. If transporting cake via car, consider not transporting it via car. 5. If your cake layers come out of the oven all dome-like, shave them down so that each layer is nice and flat so as to discourage sliding. 6. If all else fails, distract with Baskin Robbins cake and/or Diet Coke and Mentos demo. So, Lauren. What's up next?! VolcakeYES! This was so much fun. Laughed so hard forgot that I was chewing Mentos and drinking Diet Coke at the same time. That was a fail -- but fun. Wow. That cake looks CRAZY. this may or may not be my favorite bon appetempt post ever. Wow, Lauren is a cool and dedicated mom! Makes me feel lazy that I'm going the store-bought route for Henry's 2nd birthday party this weekend! Love this post! andrea: NOT making a volcakeno should not qualify one as lazy!!! and... happy birthday to HENRY!! cannot believe he'll be 2. Wow. Oh wow. I didn't even realize that was a cake when I saw the photos of your version. I thought it was some sort of meat tower with ketchup/meat juices running down it. I'm scared of the Volcakeno. Cheers to Lauren the intrepid mom!! Also, I love the perplexed look on that kid's face as he scratches his head and wonders what's going on with that cake! Yes! Could easily be called "erupting, nondescript-mauled-mammal-cake!" 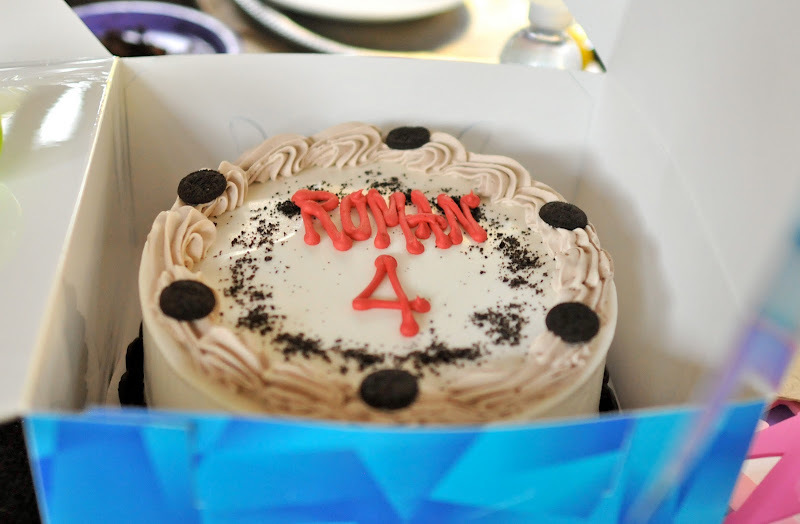 I, too, love the shot of Roman pondering the cake. i feel bad i suggested that cake to lauren! cake stress is the worst! haha i am still a fan of the special effects cookbook though! Just realized what it looks exactly like: the spinning wheels of gyro meat that they shave meat off of when you order a gyro. Holy moly! I'm with Mary, at first I was thinking giant burger. Thanks for attempting this for us! mary anne: meat tower, spinning wheels of gyro meat?? jodi: sawed off bloody limb of a bear?? omg! you are so awesome!! heehee!! so amazing!!! special effects cookbook? holy crap. looks pretty great. seems like a non-fail cake to me! also this post was hilarious. If all else fails, distract with Baskin Robbins cake and/or Diet Coke and Mentos demo." Love it that you have a plan B. haha. Though, this is really a difficult recipe to make. Whew!